Animal Science (also called Animal Bioscience) is described as "studying the biology of animals that are under the control of humankind." 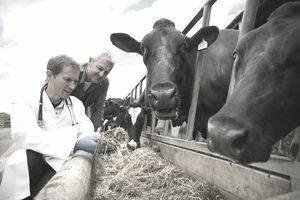 It can also be described as the production and management of farm animals. From Alabama to Wyoming, and beyond, there is a good selection of colleges and universities that are currently offering a degree program in the field of animal science. You literary can study to become an animal scientist just about anywhere in the United State. A degree in animal science can also be used as a stepping stone to a variety of graduate-level paths of study including veterinary medicine. For those not interested specifically in animal science degrees, you might want to explore the other animal-related degrees offered by these schools—many offer such animal-related options as equine science, veterinary technology, zoology, wildlife biology, and marine science. That's because the facilities used by a department of animal science to house animals are expensive and the facilities are rarely reserved for the exclusive use of the animal science program’s students. When choosing a school, be sure to evaluate each school’s attributes carefully. Your goal should be to find a program that offers a combination of hands-on practical experience as well as challenging coursework in the classroom. Animal science majors always benefit from the opportunity to put their classroom knowledge to good use in the field. It doesn't matter if that practical experience consists of working with a variety of companion animal and livestock species as part of lab work or finding practical campus employment. Also be sure that the school offers the opportunity to work with the type of animals you are most interested whether they be horses, beef cattle, dairy cattle, sheep, goats, poultry, etc. While this list focuses on institutions that offer four-year Bachelors of Science degree programs, there are also many other programs at junior colleges that offer two-year Associates degrees that can later be applied towards completion of a 4-year degree.